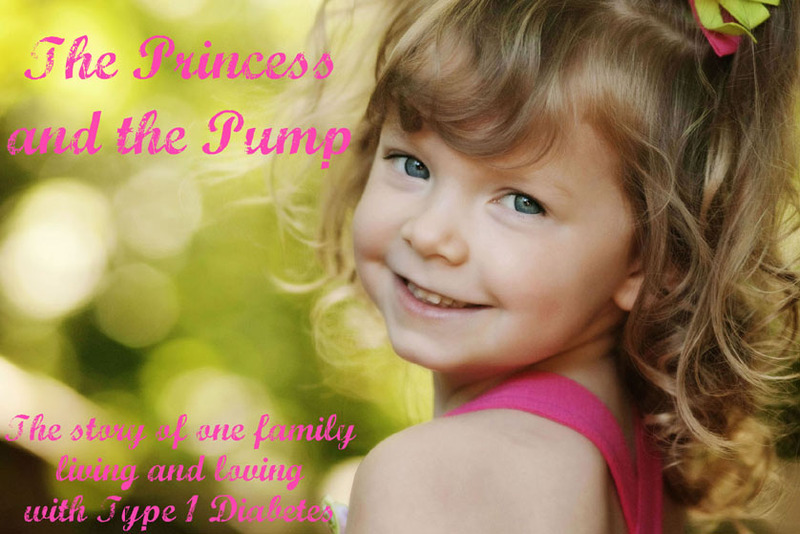 The Princess and The Pump: A Type 1 Diabetes Blog: Coco, Disney, and the JONAS Brothers?!? Oh my! Coco is a member of Mickey's gang that hangs out around the Clubhouse. You may have seen Coco before in episodes of Mickey Mouse Clubhouse. When Sweets saw the above picture, she knew EXACTLY who Coco was! "She's not NEW, Mom! I've seen her before!" Yes, we do love our Mickey Mouse Clubhouse! But then I told Sweets the "news"! "There is something very special about Coco. She was just diagnosed with diabetes." Her eyes got big and wide. She looked at me with a smile spreading across her face. "She has diabetes?!? Just like me!!" The publications will focus on the many aspects of childhood with type 1 diabetes, such as returning to school after diagnosis, going to birthday parties and playing sports. The books will be released over several years and made available through select doctors’ offices. 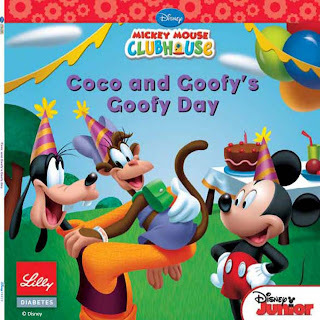 The first book is called Coco and Goofy's Goofy Day and is part of the Mickey Mouse Clubhouse series. You can read more about this book from Lorraine over at This is Caleb. But Coco isn't alone. 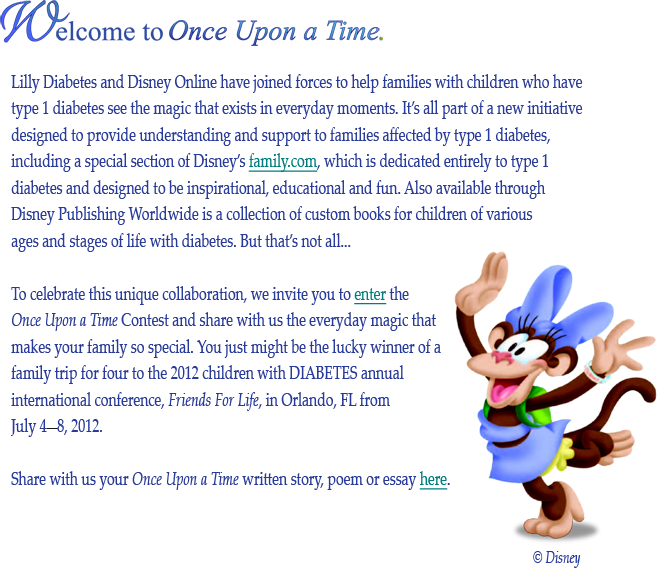 Another exciting part of this partnership is the "special online destination dedicated entirely to type 1 diabetes"! 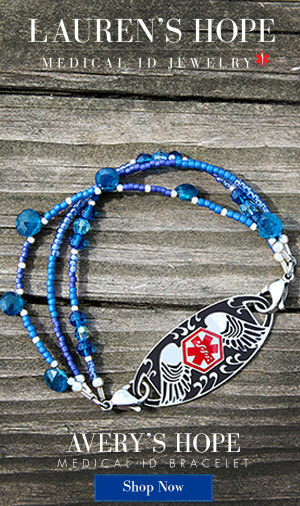 You can find this at www.family.com/type1. This website contains helpful information for families at any stage of their journey with type 1. 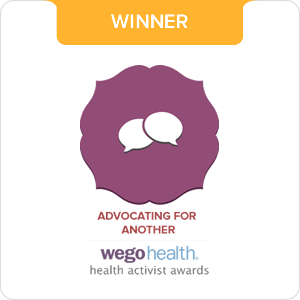 Content is provided by dietitians, psychologists, nurses, and everyday families. Released today is the announcement that Disney and Lilly have teamed up with Denise Jonas, mother to the JONAS BROTHERS, to launch a contest for caregivers of children with type 1 diabetes. Denise's son, Nick (you know NICK, right?!? Everyone listens to Camp Rock constantly, right?!? ), was diagnosed with type 1 at age 13. She has joined forces with Disney and Lilly to share her experiences of how their family was impacted by type 1 diabetes. The Once Upon a Time Contest asks caregivers to submit an original written work inspired by their child's experiences with type 1. 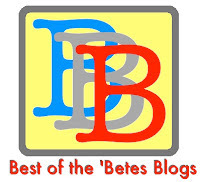 The contest runs from today (July 14, 2011) until November 30, 2011. The winner wins a family trip for four the the 2012 Friends for Life Conference in Orlando, Florida from July 4-8, 2012. You can find out more information by clicking HERE! We were unable to attend FFL this year so I missed out on the special event with the folks from Lilly when they unveiled this little piece of magic! BUMMER! But, I did have the opportunity to speak with Matt Caffrey, Product Brand Director for Lilly Diabetes, about this exciting new partnership! Some of my D Mama friends and I had some more questions... and I was able to get some answers! Lora and Wendy were curious about what sparked the connection between Lilly and Disney. I was told that connection started on an airplane! Someone from Lilly and someone from Disney sat next to one another during a flight. For most of the flight, they kept to themselves. But as they were leaving, they began to talk. This led to the exchange of business cards. The business card of the fellow from Disney ended up at Lilly Diabetes and the rest is history! Kelly wanted to know if the books would be available for purchase. The books will be available for no cost through select doctors offices. They will not be available for sale. Misty wanted to know if Coco would appear on Mickey Clubhouse on TV or if she would just be in the books. Right now, Coco will just appear in the books! Heather wanted to know if there would be a plush of Coco available. Unfortunately, there are not plans for a plush at this time. This is a big bummer for us! Sweets would LOVE a Coco! I also learned that in addition to the Mickey Mouse Clubhouse series (that will roll out over the next few years) there will also be a series for tweens and teens. There will be books aimed at boys and books aimed at girls. There will also be a travel guide and a cookbook. I was interested to know if there were any plans for the website to include a place for children. There is not. The website is dedicated to the adults. I spent some time looking around the website and I was very impressed. I felt that the articles and information found there were very timely and relevant to families. The content of the website will be updated every month. 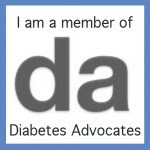 I also just loved the website's tagline: "Life with Type 1 Diabetes: Everyday Challenges. Everyday Magic." Is that not just spot on? We certainly face a lot of challenges. But we also experience a lot of magic! Something that I heard over and over in my conversation with Matt was that Lilly and Disney are really focusing on elevating the dialogue surrounding life with type 1 diabetes. They hope to show all the things that people with type 1 CAN do! They aim to do this by providing motivation, inspiration, and practical how-to's. I really can not express how excited I am about this partnership! Seeing Coco, a Disney Character, who is living with type 1 is priceless! As was Sweetpea's reaction! Someone "just like her" living with Mickey! WOW! She just said, "Mom, I SO need to get her autograph!" On a personal level, it's a wonderful thing. But it's also so very special on a larger scale. Disney and Lilly can reach such a large audience of the general population. The opportunities for education and awareness are limitless! I look forward to seeing what the future holds for this very special partnership! Thanks for the shout out, Hallie! This partnership is amazing! Charlotte and Amelia (my non-D 4 year old) LOVE her! The book was PERFECT...I loved that it touched on how eating right is important for EVERYONE and that T1s CAN eat treats too! I can't wait to some of these other plans and ideas come out! And I'm hoping that the partnership takes full advantage of their position and opportunities for education and awareness!!! Hallie-what a great post! : ) We love Coco, and Tracy, Noah's mom, gave us a copy of the book! SHe's so sweet! : ) I LOVE me some Disney, and including CWD? More Disney Love. : ) thanks for the info, girl!! Love you! Hi, Where can I buy this book? I am trying to order one online.